Got a recommendation. Place with great burgers and wings. We were going to meet our insider in the know but she bailed on us, fortunately we had good company regardless. The tavern is small, exceptionally loud, bustling, and has that sort of uppity swagger most things in Hudson do. The interior is pretty laid back chic…imagine a bar in Manhattan trying to replicate one in the village and you might get the feel. Our server was, well, under pleasant. To be fair, we were waiting for our fifth for a while, held off ordering for a bit and stayed to chat after we were finished. Yes the place was busy and we were squatting at our table, but she could have at least tried to camouflage her distaste for us. Has Anyone Really Liked One These? Maybe we didn’t fit in from the get go or she was just perseverating on lost tips from turning the table, didn’t matter to me. She could bring food to the table but her face made it evident she wasn’t interesting in hospitality of any sort. Too bad. The food was better than the service by far. We ordered a couple of different wings, three burgers, a pork sandwich and varying potato products with some additions. To start we tried some mac and cheese bites and a couple wing options. 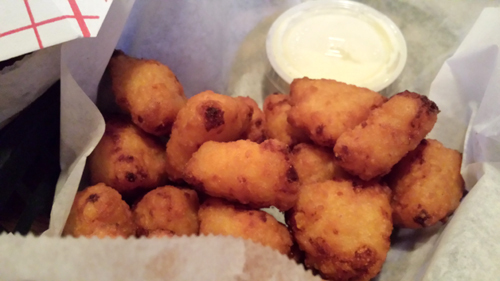 Has anyone had mac and cheese bites that were good? Not that we didn't keep eating them, but good? I still haven't. 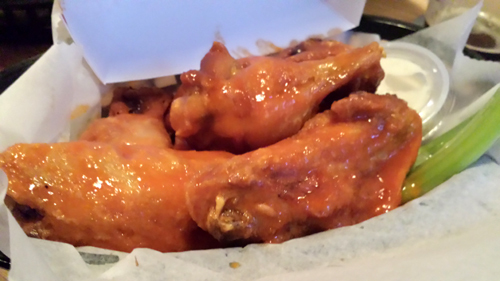 We had a short order of their fresh jumbo wings with a medium sauce. They’re average good. Nothing wrong, nothing you couldn’t find just about anywhere. We also had a 12 joint basket of their dry rub Louisiana Cajun wings. 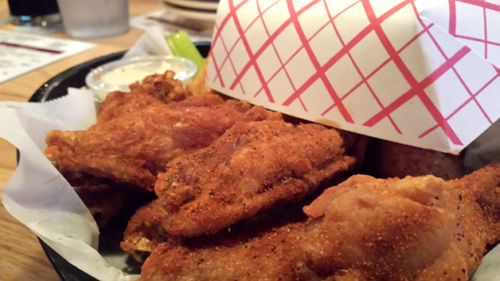 Now we're talking, a stupendously crisp surface gave way to juicy and steaming hot chicken. The crust had a forward and unapologetic kick. These are wings I would seek out again. The tater factor was pretty close to start, the waffle fries were best and held their starchy goodness much longer than their compadres. The sweet potato fries and the regular fries started off just above average but were pretty quickly limp and dissatisfying. 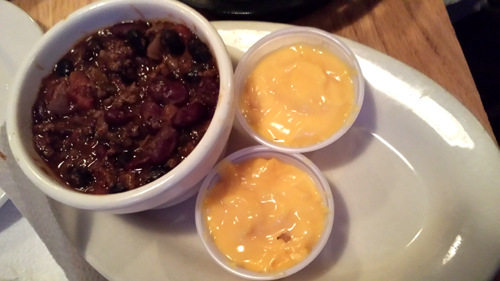 We ordered chili and cheese on the side for the tuber options and I found them to be ehhhh, and uuuugh. The chili had a pretty average taste profile but had hung out long enough to be devoid of any texture at all and nearly paste-like. The fries in each form were good enough on their own that the chili didn’t add anything worthwhile. The cheese. Well, the stuff they refer to as cheese was essentially a throw away. Gross cups of pale yellow product failed to offer dairy, salt or anything else you might want in even a “cheese food”. Don’t bother with the additions for the fries. We came in nearly unanimous on the sandwiches. The least favorite for all seemed to be the pulled pork. First, it wasn’t bad. 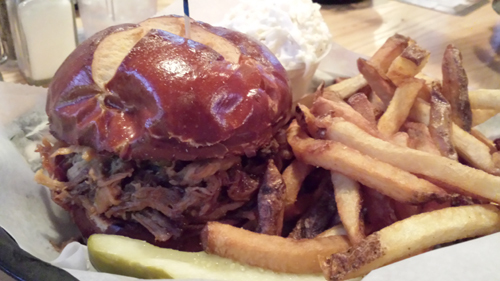 Pig, a little smoke, vinegar, spices, it was all there, a good bit of it, piled on to a pretzel bun. Like the sauced wings, it was fine but nothing you couldn’t find anywhere that cares. There was also a small cup of mayo/vinegar mixed slaw which turned out to be as average as the pulled pork. All of the burgers a labeled as half pound steak burgers, and against the world their patties stand up for themselves. They achieve the strangely unique accomplishment in the burger world of tasting a great deal like beef. Whoda thunk? There is just enough seasoning to bring the natural flavors into the spotlight…you could do way worse. 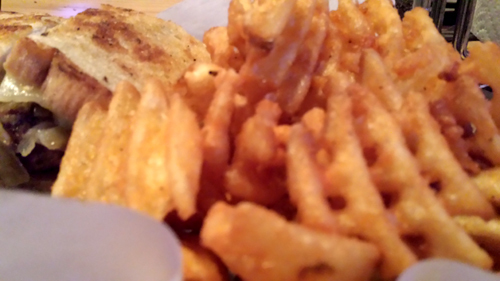 There was one burger with much more seasoning… all of our favs…but we’ll get to that in a second. 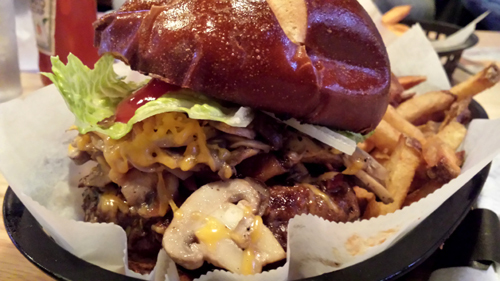 The least successful burger was the Fat Pat. 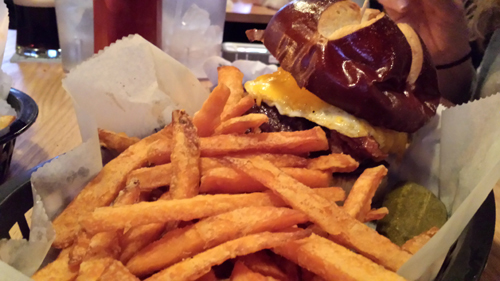 Cheddar cheese, bacon, egg, jalapeno and chipotle mayo on the pretzel roll. A more familiar combo than our other two options, which just didn’t work out for what seems to have been a single reason, the egg. EOE or EOM is what you would expect on a burger but this egg was done well past the ‘dippy’ stage and the sandwich ended up being dry and crying out for the luscious fatitude in the oozing yellow stuff. We had ordered all three burgers mid, and while the other two showed up warm through with a splash of pink in the middle, the Fat Pat patty was apparently temped by the same dude who overcooked the egg. In most places, it would be functional but the other two burgers showed what Kepners is capable of, making Pat seem sad in comparison. I ordered the Santa Fe patty melt. 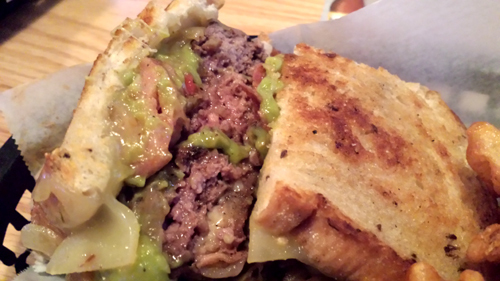 Steak burger, on rye, topped with Andouille sausage, pepper jack cheese, peppers, onions, guacamole and chipotle mayo. Hello. Maybe Hola. Probably somewhere in between. The rye made for a nice departure from the pretzel buns, the guac had a nice shot of citrus, the veggies held their own, the spicy elements added a bit of Woo Hoo. I like patty melts. I like this more than the standard. By far, the best burger of the night was created by students from the Western Reserve Academy called the Unreserved. Must be some program they have there. The seasoning really took this thing over the top. The beef was combined with diced onions and garlic , and then marinated with Worcestershire and Tabasco sauces. Top it all with mushrooms, bacon, cheddar cheese, romaine lettuce, mustard and ketchup and you have a burger that hits your tongue with force from all directions. What really struck me was the Tabasco/Worshti mix lending a bit of heat and a fistful of umami, which was simply beautiful. Our 'plus one', put the whole experience somewhere between “yummy” and “decadent™”. Of course, he might have just been glad we only got $8 worth of pulled pork instead of $150. Just a little inside joke. 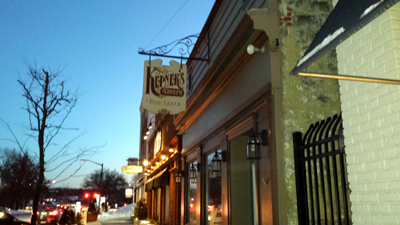 If you know what to get at Kepners, you can do really well.